Anti-reflective coating—reduces reflections, allowing more light to pass through your lenses for better clarity, especially at night. Anti-reflective coatings also help lenses look nearly invisible, reducing distraction and improving eye contact. Crizal® lenses and Xperio UV™ lenses provide this feature by reducing the effects of glare, as well as protecting against scratches and smudges. UVA and UVB blocking—can help protect your eyes from the sun’s damaging ultraviolet rays. Xperio UV lenses, Transitions® lenses, and Crizal lenses offer protection for your best vision under the sun. Adaptive treatment—this feature allows lenses to automatically adjust from clear indoors to dark outdoors. With Transitions adaptive lenses, you get just that—lenses that adjust from clear to dark, and every shade in between. Smart Blue Filter™—a feature embedded in lenses to reduce the amount of Harmful Blue Light* entering the eye by 20%. Harmful Blue Light is the blue-violet wavelengths between 415-455 nm on the light spectrum believed most toxic to retinal cells. 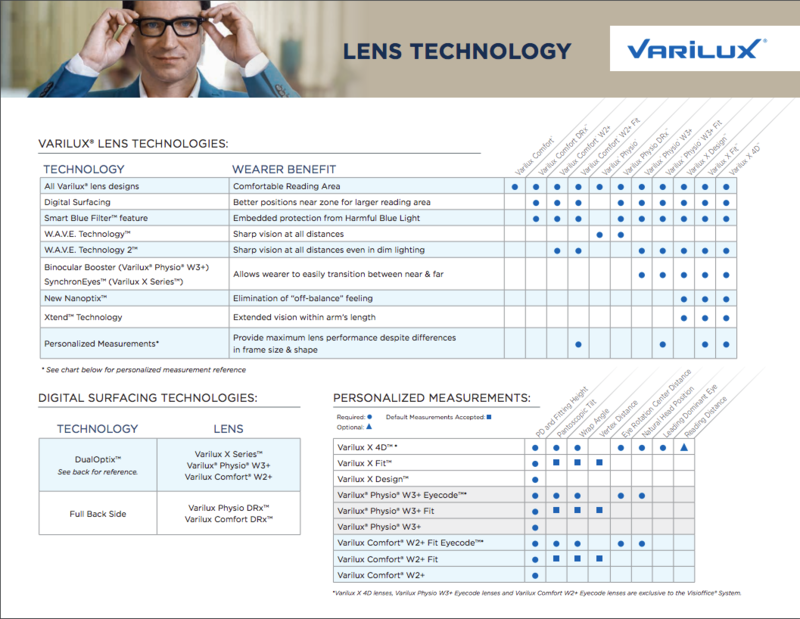 Eyezen™+ lenses, Transitions lenses, and select Varilux® lenses offer this breakthrough feature. Polarization—a special filter that blocks intense reflected light. Xperio UV polarized lenses eliminate blinding glare so you can see the outside world with sharper color and greater depth. Progressive lenses Progressive lenses provide sharp vision at every distance—even in dimly lit conditions—eliminating the blurriness and low-light issues of ordinary progressive lenses. We carry Varilux brand progressives. We offer Crizal, Crizal sapphire, Crizal prevencia and Crizal avance, Crizal alize. No-Glare lenses give you the clearest vision possible, so you’re ready for whatever comes your way—glare, scratches, smudges, and even UV light.